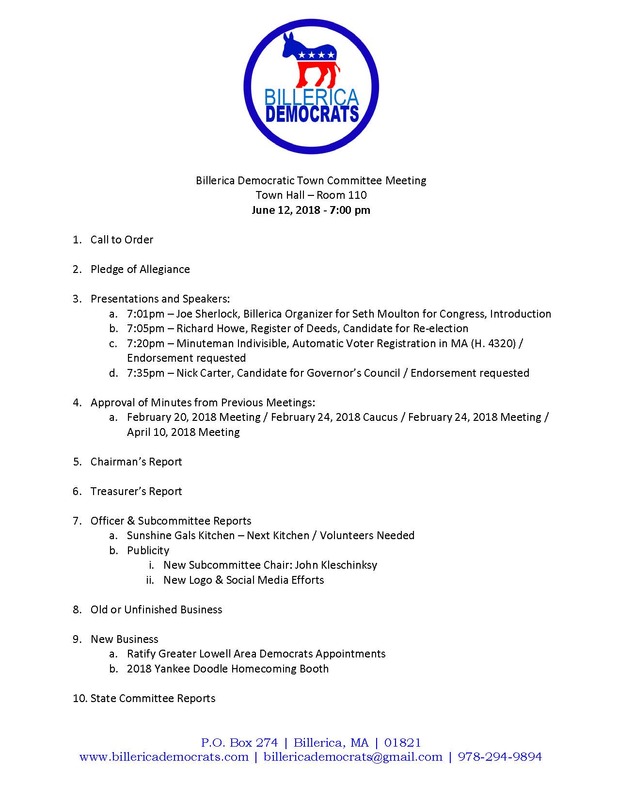 Billerica Democratic Town Committee | Bringing Democrats together to move Billerica forward! 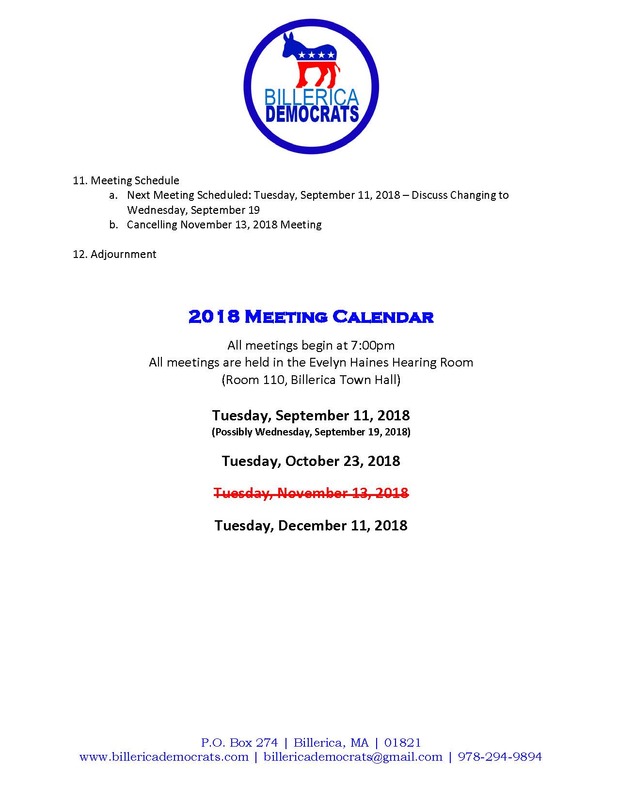 The December meeting of the Billerica Democrats has been changed to a social gathering in the Back Function Room at Chung King / Rick’s Cafe in Billerica Center, 7:00pm – 9:00pm. This is a chance to get to know our members and discuss our plans for 2019 and beyond. Please feel free to pop in or out anytime during the evening. We have to let the restaurant know the number of attendees on Monday, 12/10/18. Our next Billerica DTC Meeting is next Tuesday, June 12, 2018 at 7:00pm at Town Hall, Room 110. The Agenda for this meeting as well as the Minutes from the last meeting are attached to this email. Richard Howe, Candidate for Register of Deeds; Automatic Voter Registration in MA; and Nick Carter, Candidate for Governor’s Council will all be speaking. Please review each website and come prepared with questions (if you have any). Each has requested an endorsement from the Billerica DTC. We are very proud to announce that the Billerica Democratic Town Committee has unanimously voted to support and endorse Andrew Deslaurier for reelection to the Billerica Board of Selectmen. Over the last several years, Andrew has worked tirelessly to improve the quality, openness, and financial strength of our town. He will continue to bring the professionalism, background, and measurable results that you have come to expect from his service on the Board. During Andrew’s tenure, the financial strength of our town has grown through strategy and discipline without taxing to the max. The town is $10 million dollars under Proposition 2 ½, and this has been achieved without lowering the quality of the services we provide to residents. During this time Billerica has built one school with another on the way; built and expanded sewer instead of providing empty promises; reduced the number of streets disenfranchised by the archaic and unfair unaccepted streets bylaws; and continued investing in our public safety and DPW services. Billerica has done all of this while keeping the town affordable, so we can maintain the strong community that makes us a home to everyone. Billerica’s local government has never been more open and accessible, with nearly every department having a social media presence and more data than ever available on the town’s website. We have transferred the knowledge and ability to influence government from a group of insiders to the larger community, with more residents now knowing what their government is doing and how to make the changes they want to see. The town has sought to pursue innovative programs like Complete Streets, electricity aggregation, and multiple other grant programs to pursue cost savings and smart growth for residents. It is important that we as a community maintain the growth of professionalism, and results that we have come to expect, so that we can be prepared for our bright and exciting future. We ask you to please join all members of the Billerica Democratic Town Committee in voting for Andrew Deslaurier for Selectman on Saturday, April 7, 2018, so that he may continue to be your voice for our home. Questions? Interested in joining? Let us know! Billerica Democratic Town Committee · Bringing Democrats together to move Billerica forward!